Our kids always longed to explore the Tabernas desert landforms closer. So one sunny December morning, we decided to explore the "Badlands". Almeria is the place with most sunshine hours of all Europe, which makes it extremely arid and harsh. Due to its scarce forests and vegetation, it is a perfect place to study the geological process. Rain seldom falls but when it does, there are intense floods which remove the soil, shaping a marvelous and unique landscape, of the so-called "Badlands". Some millions years ago, the Tabernas Desert emerged from the bottom of an ancient seabed, which geological deposits form the present territory. 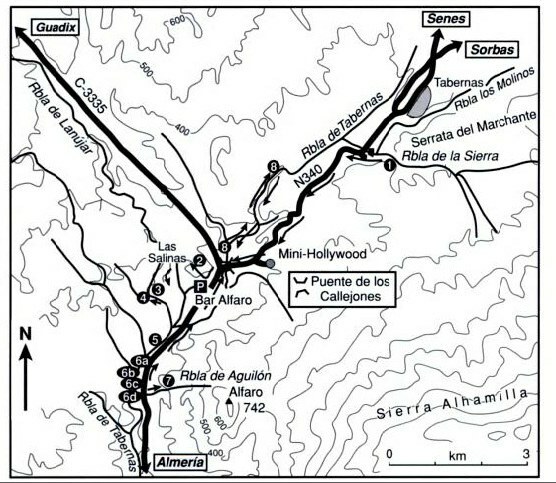 About eight million years ago (in the Middle Miocene) the land settings of Almeria, both, the surface and the submerged under the sea, was similar to the present one, but not identical: the sea spread over the territory of the Tabernas Desert reaching the foot of Sierra de los Filabres, on which edges there are still fossil coral reefs to be found, which literally mark the position of the ancient coastline. 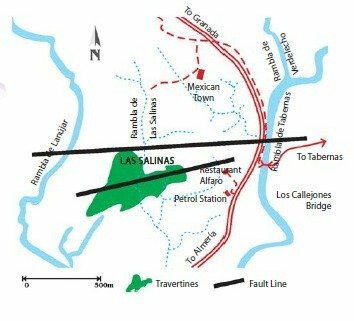 In the slope of that ancient sea, submarine ranges deposited large and powerful sediments which were pulled off from the emerged relief by the rivers. These materials, called turbidites, consisting in marlstone and sand, are today styling most part of the Tabernas desert landforms. 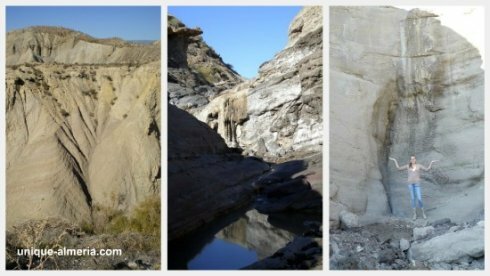 One of the most surprising and at the same time poorly known aspects of recent geological processes that can be studied and observed in the Tabernas Desert is the presence of Quaternary Travertine formations. The soft nature of sediments, which over the last eight million years filled the depression of Tabernas, the slow and continued elevation of the surrounding mountains and its arid and often torrential climate have characterized this desert landform for most of the recent quaternary period, modeling and shaping one of most erosive and spectacular desert landforms and landscapes in the entire European continent. It is a geological landscape of African reminiscences that during generations called the attention of geologists, naturalists, landscapers, photographers and film producers. This spectacular erosive scenery is therefore not attributable to human action, but to the combination of a number of geological factors and to its own natural evolution, which makes it one of the most valuable places of scientific value and training for the studying and understanding the natural phenomena of erosion and desertification in the Mediterranean basin. For beginners in Geology like us, the following leaflet will be fine and just for fun! It was helpful to us, since it comes with some directions and useful explanation about desert landforms and features. Let a local be your guide! 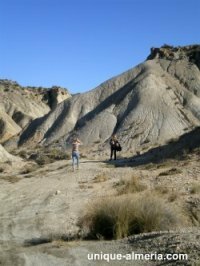 Ricardo from Rutas Por Almeria conducts the most unique hiking tours. You can join him on a desert hiking tour through this area, where you will visit one of the most important film locations as well as the salt travertines, the Tabernas Basin and Badlands. 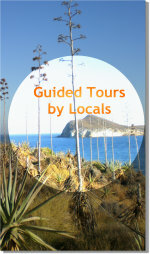 A spectacular tour, where you will discover different desert landforms! Contact Ricardo here to inquire and book a Desert Hiking Tour.